We are happy to introduce our newest piano bench, the Forte Adjustable Piano Bench. 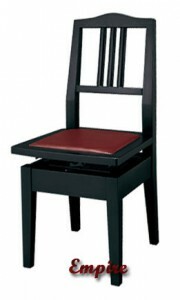 It features a high polish finish, square tapered legs, and a comfortable vinyl upholstered top. The bench uses attractive wooden knobs (compared to the cheap looking plastic knobs you’ll find on many cheaper imports). Weighing 22 pounds, the bench adjusts in height from 18.5 inches to 21 inches. 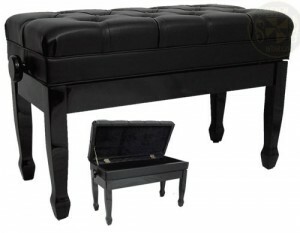 If you have an upright piano and are looking for an adjustable piano bench, we recommend taking a look at this product. 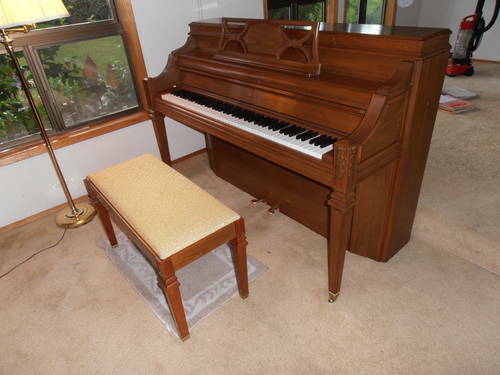 It’s size and design would look good in front of an upright or even smaller grand piano. Current sale price is $190.00, with free shipping to the lower 48 states in the US. A very good deal, and great quality, for a sub-$200 piano bench. For those who spend hours practicing the piano at a time, or who have a bad back, an adjustable piano chair offers the ultimate in comfort and posture support. The sloped black of the upper part of the chair puts the musician in the correct posture position, alleviating pressure on your lower back. The bench features a padded leatherette (vinyl) top for additional comfort while sitting. Having played for my entire life–when I practice the piano, I use my piano chair. We are very impressed with this piano chair, and it is a very welcome addition to the market. Piano chairs have become nearly impossible to find, for the simple reason that they are so much more labor intensive/expensive to make, that it is not financially worthwhile to produce them over piano benches. Furthermore, when you do find a piano chair, it is typically not adjustable (Jansen for instance makes a piano chair, but it does not adjust. 5-10 years ago they did have adjusting chairs, but it became too expensive to make them). A testament to this, Jansen’s non-adjustable chair is price at $433.35, whereas the Empire adjustable piano chair is currently priced at $264.99. In sum, we highly recommend the Empire Piano Chair. It’s a well built product, and fills a void on the piano bench market today. For those of you who spend long periods of time at the piano and begin to get uncomfortable, a piano chair may be just what you’re looking for. 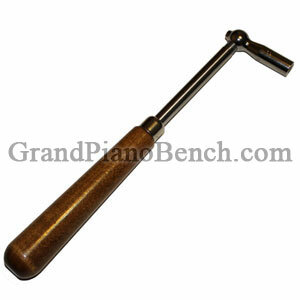 The Student Piano Tuning Lever is a high quality, American made piano tuning hammer. What separates it from similar hammers is its ability to inter-change heads and tips. Whereas the gooseneck tuning hammer features a solid, one piece construction, the one piece head/tip combo of this tool can be unscrewed, and replaced with a different head/tip. This allows the tuner to purchase a single lever, and acquire any tips needed other than the standard 5 degree, #2 star tip. The Student Tuning Hammer features a lacquered wood handle which has a smooth tapered feel, and is 6″ in length. With a stationary stainless steel rod, the overall length of the tuning hammer is 11 inches. Features a standard head and tip, which is 2-1/2″ long with a 5 degree angle and a #2 star tip. The #2 star tip that is included with this hammer is designed to fit tuning pins with square heads. It will fit tuning pins on virtually all pianos. These professional looking, chrome plated heads and tips are made from tool steel. Tuning tools are like any other tool–quality is key. Our selection of 15 piano tuning hammers are all manufactured in the United States, using high quality materials and craftsmanship. Recently a number of Asian imports have arrived on the market, and they have been nothing but problematic. They break down quickly, with the metal shafts often so thin and weak, they bend during tuning. The connection of the metal to the wood handle often breaks as well. At best, you’ll get a handful of tunings out of these Chinese imports. A large number of our customers are people who are buying a quality USA made tool, after having purchased a cheap Asian product. We recommend spending the money and getting a high quality, long-lasting tuning lever to begin with–it will last you decades if properly taken care of, and save you money in the long run. The Keyes Impact Piano Tuning Lever is the ultimate tool for tuning upright pianos. The tool was designed by Otto Keyes, one of the top piano technicians in the United states. The impact tuning hammer has an adjustable sliding weight, which can move to 8 different positions along the handle. The reason for the adjustment, is to relieve excess strain on your shoulder, back and arm. The constant tension and repetitive movement of an outstretched arm in a restricted range using a traditional hammer can lead to fatigue, strain, pain and even repetitive stress injury. The lever weighs 21 ounces and is 11″ overall in length, with a #2 star tip. Impact-style tuning allows very precise, predictable movements, giving the user precision and accuracy. Impact tuning levers have a counterweight in the handle at the far end from the head. The lever is turned in tiny increments with a flick of the wrist. 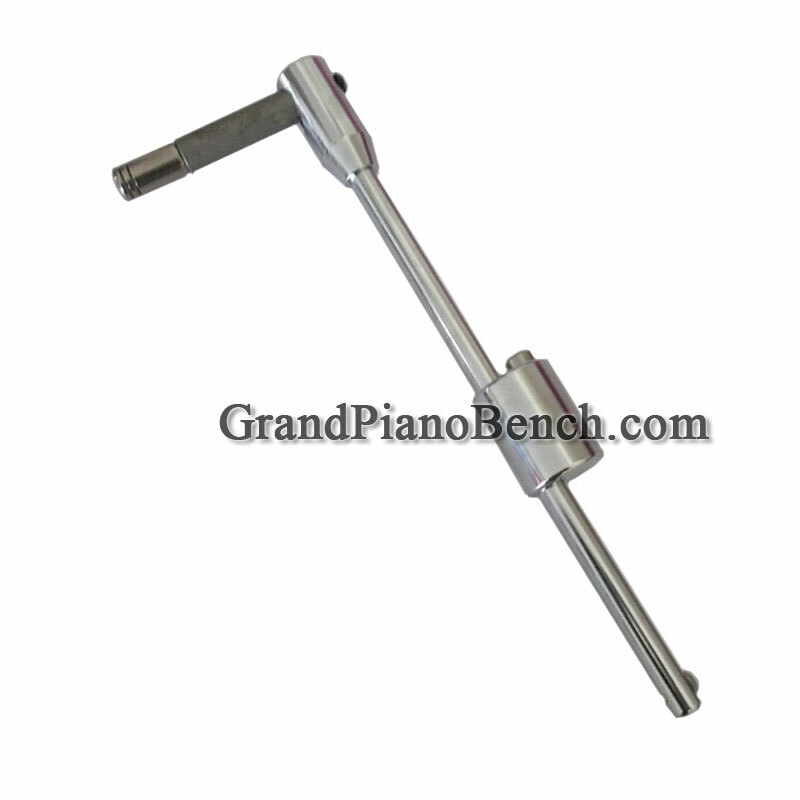 Need a quality piano tuning lever at an economical price? Then we suggest the gooseneck piano tuning hammer. Made in the United States, it comes with a star tip (the tip you want for your square tapered pins), 6-1/2″ wood handle and nickel plated shaft. The overall length is 12″. Current price is only $39.99! This gooseneck tuning lever is great for new tuners or for touching up your piano in between tuning . Using this tool, and a couple of our quality piano mutes, will give you the supplies you need to make adjustments. A high quality, economic solution, keep your piano sounding it’s best with this lever! Looking for a complete kit of piano tools to tune your piano? 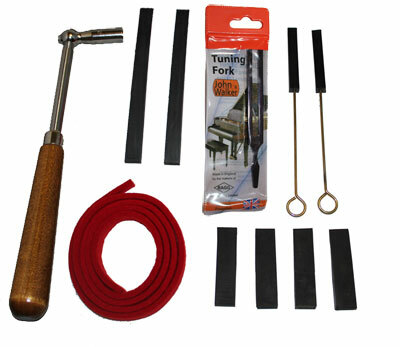 Our piano tuning kit comes with everything you need: piano tuning hammer, piano mutes, temperament strip and a john walker tuning for. High quality, American made tools, the kit contains the most commonly used mutes, and will last a lifetime. -Standard head and tip is 2-1/2″ long with a 5 degree angle and a #2 star tip. John Walker piano tuning forks are known for their quality and superior performance. They produce a pure note (no overtones) with a sustain of 30-60 seconds to ensure accurate tuning. John Walker tuning forks are the highest quality tuning forks on the market today, manufactured for more than 150 years in Sheffield, England, by the Ragg Family. Made from hardened and tempered blued steel with gilt lettering stamped for the note and frequency. Each tuning fork is approximately 5.5 inches long. 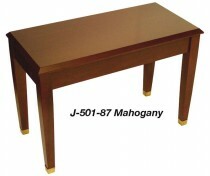 Without a doubt, mahogany is the most difficult finish of piano bench to purchase. 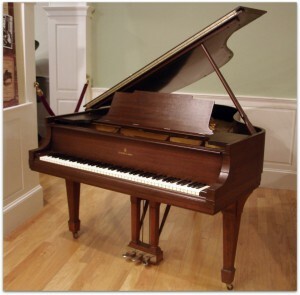 There is an endless number of mahogany finish pianos on the color spectrum, ranging from light to dark brown, and with different hints of red and purple highlighting the color. Keep in mind that unless you purchase the bench unfinished and have it professionally finished to match your piano–any bench your order is not going to exactly match. The key is to get one that blends, and is closest to the shade of your piano. Here are some helpful hints to help you decide on the right bench for you. When deciding on a bench, you should first decide which area your mahogany piano falls into. To over simplify and generalize, mahogany will have to a varying degree, amounts or red and/or purple in the finish (which is what separates it from walnut, which is just a flat brown). Most mahogany pianos have a hint of red in them (think of a mahogany desk), though some pianos also have purple with that red, giving it a much darker color (often called dark mahogany). To get an idea of the difference, take a look at the 3 images below. The first image is brown, with hints of red (it may be hard to notice the red within the color, but think of a flat, plain brown color as an alternative). The second piano has much more red in it, with a hint of purple. 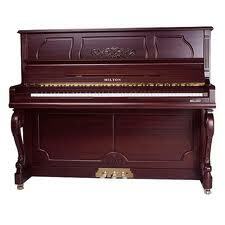 The final picture is of a dark mahogany piano–you will notice the very strong purple tones in it. Note on red mahogany piano benches: Some companies do offer a red mahogany piano bench, but if you have a piano with just a slight hint of red it in, you do not want a red mahogany piano bench. A red mahogany bench is VERY VERY VERY red, and has a strong purple tone to it. It’s not a brown with hints of a red/purple. Red mahogany pianos do exist, but they are not very common–and if you had one, you’d probably know. 2). 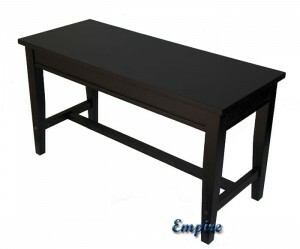 Choosing your mahogany piano bench: the difference in finish between American and Chinese manufactured piano benches. With these color differences in mind, if you determine you need a finish more like the American shade of mahogany, then the bench manufacturer you will want is Jansen. Jansen is the last US manufacturer of piano benches. They are more expensive than the imported benches, but they are better quality (Jansen is world renown as the top piano bench manufacturer). 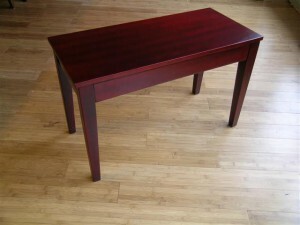 If you want a more purple Chinese style of mahogany, then you will have a wide range of imports to choose from. As mentioned before, the only way to get an exact match in mahogany to your piano is to order a bench unfinished, and pay someone locally to professionally match it to your piano. Any finished bench you buy online will not match exactly. With that in mind, you need to consider how much the bench you purchase online, will blend or class with your piano. If you are worried there is going to be a stark contrast between wood finishes, the way around it is to get an upholstered top piano bench (either standard bench with an upholstered top, or an adjustable piano bench). The upholstered top will help blend the difference between your piano and the bench, whereas if you get a piano bench with a wood top, the eye will be drawn to the wood top and the difference between the two pieces. Adjustable piano benches have become the most desired piano bench on the market today, but an issue that arises for some customers is that there is a limited number of duet adjustable piano benches, and these benches largely do not come with a music storage compartment. After many requests for such a bench, we proudly introduce the Maestro Deluxe Duet Adjustable Artist Bench with Music Storage Compartment. A high quality imported piano bench, it features a diamond tufted top made out of synthetic leather (vinyl), spade legs, and a high polish finish. Available in walnut, ebony (black), and mahogany. One aspect of the bench we very much appreciate are the finished wooden knobs on the side, that raise and lower the adjustable bench from 18.5″ to 21″. Too often, imported benches use plastic knobs that give the bench a cheap look (I compare it to putting plastic rims on a nice car…). If you are considering a duet piano bench, and need that music storage compartment, we recommend taking a look at the maestro. Attractive, well built, and very reasonably priced, this bench will look great in front of an upright or grand piano. Many piano practice and performance settings require a stronger, more heavy-duty piano bench. Prolonged used of a piano bench, with continued rocking back and forth, loosens the piano legs and throws the legs out of alignment, damaging and eventually breaking the bench. 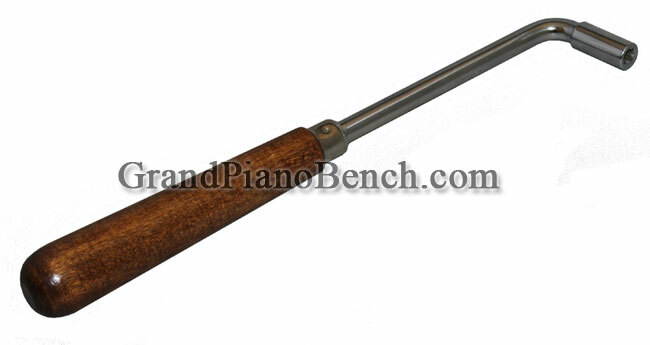 There is however a solution in the piano bench world– the reinforcement crossbar. The cross-bar secures the legs in place and evenly disperses the weight, making the piano bench overall a much more study structure. Our Empire Duet Wood Top Piano Bench is an especially heavy duty piano bench, featuring a reinforcement cross-bar and 100% hardwood construction. 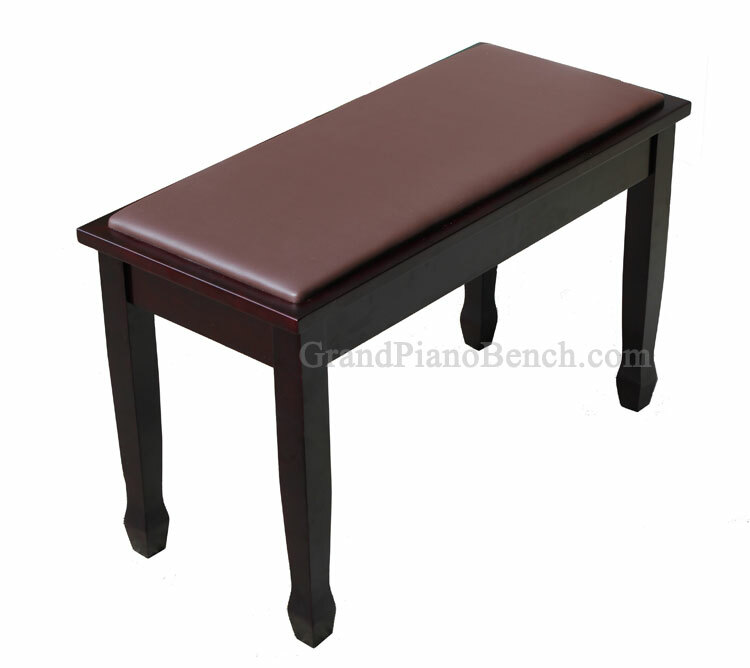 The bench is ideal for piano teachers, schools, churches, home use, or anywhere a heavier duty bench is needed. A well built and long last grand piano bench, the music compartment is routed in (meaning that it is inserted into a groove in the wooden frame), instead of stapled like you will find on most imported piano benches. This adds to the benches structural stability, and prolongs the life of the bench. Plus you can you safely store a good amount of sheet music in the compartment, without having to worry about the bottom falling out over time. The Empire piano bench features straight tapered legs, which have rubber bumpers on the bottom to protect your floor from damage. The duet has a deep music compartment, measuring 2-3/8″. Having reviewed this grand piano bench, we think it is a great buy, and an ideal solution for those looking for a stronger, more durable piano bench. What are the Best Piano Cleaning and Piano Polish Products? A piano is an expensive and beautiful instrument, and should be properly taken care of. The right piano polishes can make your finish dazzle, and the right piano cleaning supplies can keep your finish lasting. With that in mind, the question becomes, what piano care supplies should I get? In the United States, there is only one option for piano care, and that is Cory piano products. And by that, we do not mean that we are promoting it as the best choice, it is the only choice. Cory is the only manufacturer that specializes in cleaning products for your piano. Fortunately for the consumer, Cory produces a very high quality product, with a large selection of cleaners, polishes, and cloths for every type of piano finish. We hold in particularly high regard, Cory’s Piano Polish for High Polish Pianos, and their Satin Piano Polish. When looking to start on polishing your piano, determine whether you have a high polish or satin finish, and get the corresponding product above. We also recommend taking a look at the Cory piano care kits, which include piano polish, piano polish rags, and key-brite, which cleans your piano keys. These basic kits are a great way to bring life to your piano.